If you’re like me, you’re probably bummed that Einstein Bros. Bagels won’t be open on Christmas Day so you can have a delicious breakfast with us. 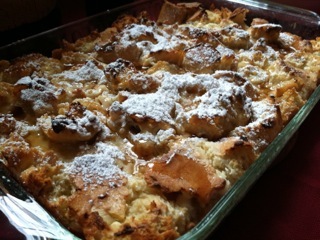 Well, it turns out you still can, with our recipe for EBB Challah Cream Cheese Breakfast Casserole! Read below for ingredients, instructions, and tips on making this wonderful breakfast for the whole family! 1. Place challah cubes in 13 x 9 buttered baking dish. 2. Beat softened cream cheese with sugar at medium speed until smooth. 3. Add eggs one at a time to cream cheese mixture. 4. Add remaining ingredients, beat until well combined. 5. Pour cream cheese mixture over bread cubes, ensuring even coating. 6. Set in fridge overnight. 7. Next morning, remove casserole 30 minutes prior to baking in oven at 375 degrees Fahrenheit. 8. Bake uncovered 45 – 50 minutes. 9. Serve with powdered sugar or additional maple syrup. – If you want to mix up the breads, substitute 4 challah loafs for 4 cinnamon raisin bagels. – Call ahead at our stores (865-675-6667 Farragut / 865-951-1515 Cedar Bluff) to special order our challah loafs. It ensures speedy pick-up and that we have what you need when you need it. DON’T FORGET! We will be open from 5:30 AM to 4 PM on Christmas Eve, so make sure you pre-order your bagels and pick them up before closing time.